Happy November friends! I can’t believe that October is over already. Halloween was uneventful for us, except for me dropping off Alex at the airport to fly to California for his first residency interview. Honestly it’s crazy to think back to his first year of medical school, and how far down the road we thought this day would be, and yet, it snuck up on us quietly and swiftly. Well I guess not totally quietly as there has been a lot of thought, planning, and prayer for this! If you have never been to Portland, then let me tell you - this is food truck heaven! I feel like my palate for ethnic foods greatly expanded during my time there as there was literally every type of food truck imaginable. 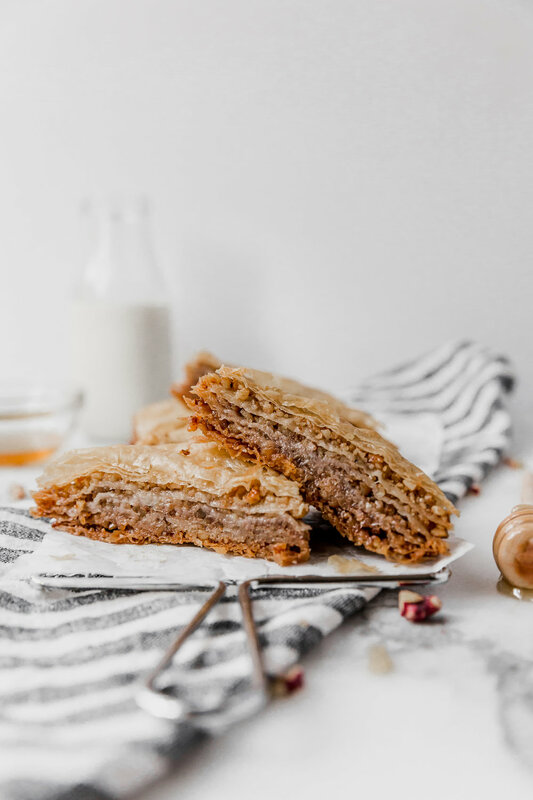 And speaking of ethnic foods, let’s talk about this baklava! 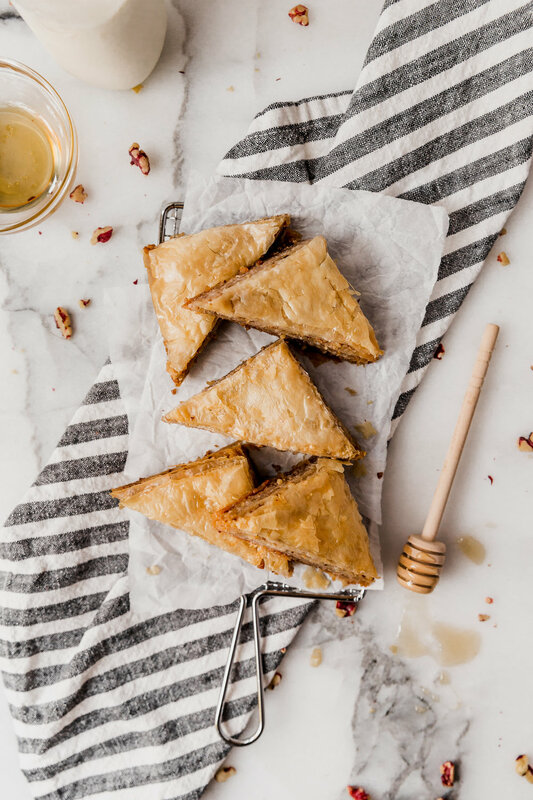 Baklava is a Middle Eastern pastry comprised of a walnut cinnamon mixture sandwiched between countless layers of phyllo and soaked in honey. It is my absolute favorite thing to get at the annual Greek Festival in Minneapolis because it is so amazingly good. 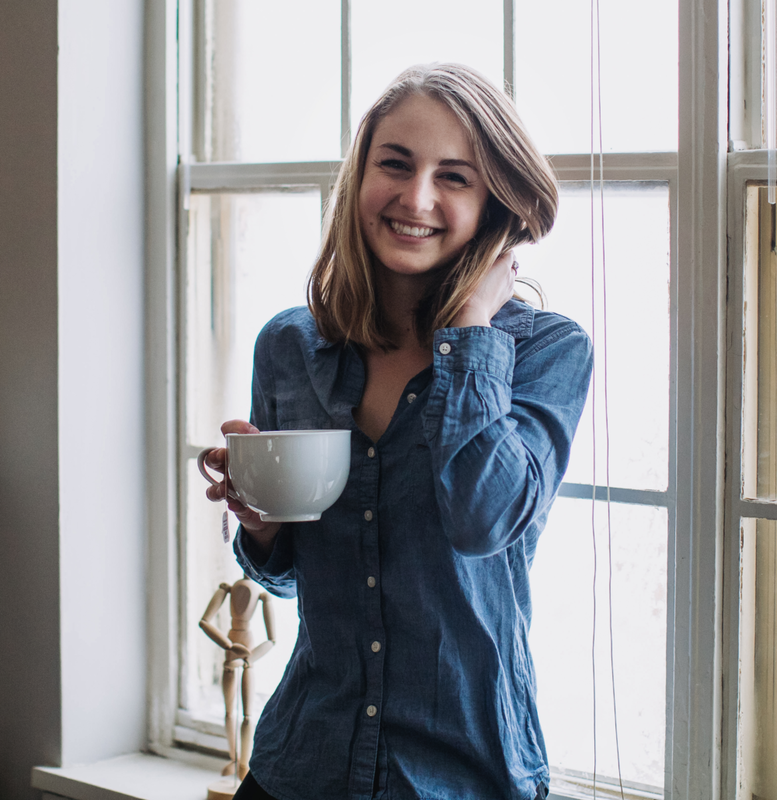 It is incredibly rich too, so you don’t need much to feel satisfied. It isn’t difficult to make - it is just tedious in the preparation when creating all of those layers. But it is definitely worth the effort! In a food processor, pulse the walnuts until finely chopped. Transfer to a large bowl. Add the cinnamon and 2 Tablespoons melted butter. Mix to combine. Set aside. In a small saucepan, melt 1 1/4 cups butter. Once melted, remove from the heat. Roll out the phyllo. Gently place the baking pan over the phyllo, and cut off the excess (~1 inch) dough. Remove the pan, and place a damp towel over the phyllo (this will prevent the phyllo from drying out). Using the melted butter, brush the bottom and sides of a 9"x13" baking pan. Place one sheet of phyllo in the bottom of the pan. Use a pastry brush to brush the top with butter. Repeat until there is a total of 8 phyllo sheets. Spread 3/4 cup of the walnut mixture evenly. Layer and butter 6 sheets of phyllo. Evenly spread 3/4 cup walnut mixture. Repeat 3 more times. End with layering and buttering 8 sheets of phyllo. While the baklava bakes, make the syrup. In a saucepan over medium heat, combine the honey, water, sugar, and lemon juice. Stir until the sugar has dissolved (~5 minutes). Remove from heat and set aside to cool. 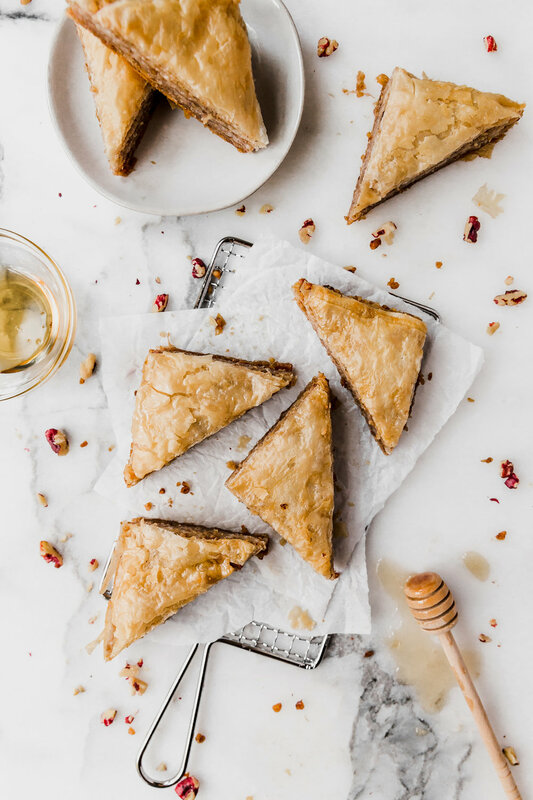 Once the baklava is done, remove from the oven, and immediately pour the syrup over it. Allow the baklava to soak in the syrup for 6 hours to overnight, uncovered at room temperature. Store in an airtight container. 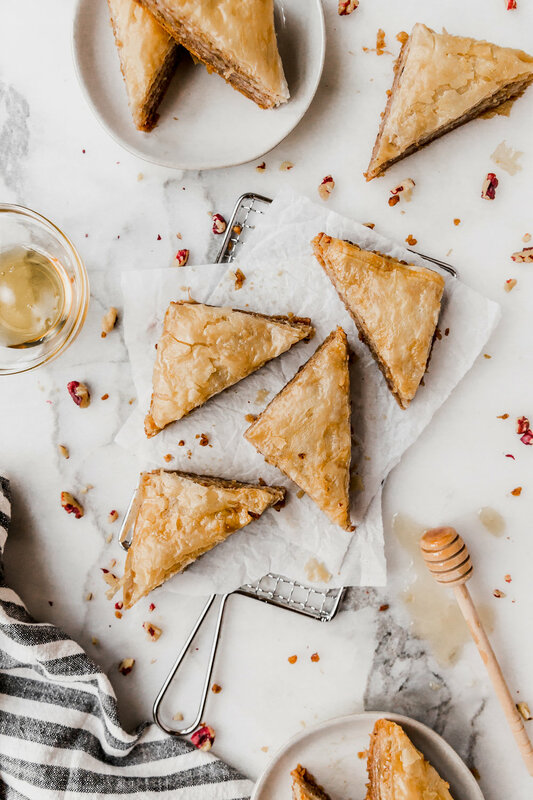 If you want to preserve the crispness, then store at room temperature, but if you prefer a chewer baklava, store in the refrigerator.